The energy storage company SaltX Technology – listed on Nasdaq First North – is one of the 2018 New Energy Pioneers awarded by Bloomberg New Energy Finance (BNEF). Innovative companies from around the world are recognized for their leadership in clean energy technologies and business transformation. BNEF has carefully selected, and awarded, the best innovators that are revolutionizing the energy, transport and technology sectors. 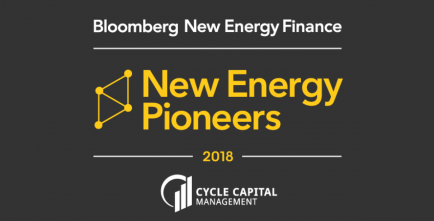 The 2018 New Energy Pioneers were announced at the Bloomberg Future of Energy Summit in New York on Monday. By recognizing innovators, Bloomberg aims to highlight and accelerate the transition that is underway in today’s new energy economy, towards new business models, technologies, market structures and commercial opportunities. The winners are responding to changes and disruption in the energy system and are pursuing new opportunities in areas as diverse as storage, electric vehicle charging, digitalization, heat recovery and blockchain. "We are very encouraged by the innovation, determination and creativity shown by these Pioneers and by the potential that they have to help transform the energy and transport systems. We are, as ever, very grateful to our external judges on the selection committee who had the challenge of choosing ten winners from a strong pool of entrants." Bloomberg New Energy Finance (BNEF) is an industry research firm focused on helping energy professionals generate opportunities. With a team of 200 experts spread across six continents, BNEF provides independent analysis and insight, enabling decision-makers to navigate change in an evolving energy economy. Leveraging the most sophisticated new energy data sets in the world, BNEF synthesizes proprietary data into astute narratives that frame the financial, economic and policy implications of emerging energy technologies. Bloomberg New Energy Finance is powered by Bloomberg’s global network of 19,000 employees in 176 locations, reporting 5,000 news stories a day. Visit https://about.bnef.com/ for more information. SaltX Technology - www.saltxtechnology.com - develops and sells patented energy storage technology. Main customers are major global OEM partners and energy companies such as Alfa Laval, Vattenfall, Mobile Climate Control and Rheem. SaltX Technology's share is listed on Nasdaq Stockholm First North. SaltX Technology’s Certified Adviser is FNCA Sweden AB.